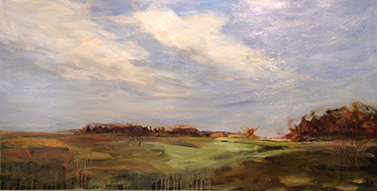 Angela Saxon, A Leelanau County artist, Angela paints from the landscape, focusing on expressive movements in nature. “As a little kid, when asked what I wanted to be, I always replied, ‘an artist.’ But then there was that question of what to paint or what to draw. I remember asking my mom this question many times. I suppose she offered suggestions, but somehow the void was never filled. 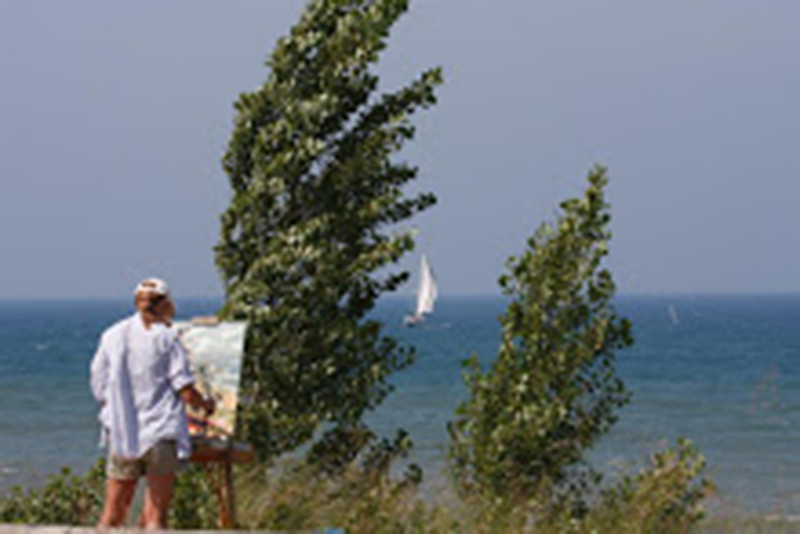 “I went to college to study art, and still was asking the same question….what should I paint? I earned my BFA in painting, and made a lot of paintings in the process. I explored color and pattern, the still life and interiors, and the general moving around of paint. But something was always missing–I was still searching for THE answer. A few years after graduating, after marrying and having my first daughter, our family moved to northern Michigan. I don’t know what my exact feelings about landscape paintings was, but it wasn’t necessarily something I ever thought I’d strive for. But there it was. The landscape. Staring me in the face all day every day. It is spectacularly beautiful in northern Michigan, in any time of the year. After a few months I finally started to paint it. And the more I paint it the more I see. My eye then and now is just drawn into places in the landscape. Light playing across a meadow, huge clouds towering over the lake, it’s always captivating to me. Sometimes I wonder how many times I can paint a cloud over a lake, but so far it’s new to me every time. And I think that it is through this subject matter that my work is starting to move away from the literal,…expressing more of the emotion of what I’m looking at, not just the imagery.